The Middle Tennessee men’s and women’s basketball teams played back-to-back exhibition games Monday evening at the Murphy Center. The women defeated the University of Alabama-Huntsville 75-50 to finish off their final exhibition game of the season. The Kermit Davis-led men’s team, however, suffered a setback against NAIA-member Martin Methodist by a score of 76-67. The Blue Raiders women’s team started off the night in a matchup against UAH. Great defense and rebounding keyed the victory for MTSU, as the Blue Raider defense forced the Lady Chargers into 30 turnovers, scoring 37 points off these miscues. The Blue Raiders secured 19 offensive rebounds, turning them into 18 second-chance points. Points in the paint belonged to MT as well, outscoring UAH 34-20. The star of the night was sophomore Olivia Jones, who shot 8-of-16 from the field for 17 points. The Murfreesboro native grabbed seven offensive boards on her way to picking up 11 rebounds in a double-double effort. Jones also led the team in assists and steals, dishing out four assists and swiping six steals. Junior transfer Brea Edwards scored 11 points, and junior Caroline Warden tallied 10 points off the bench. The MTSU defense was dominant from the start as they held UAH scoreless for the first six minutes, forcing the Lady Chargers into four turnovers and 0-of-4 shooting from the field. In the first half, UAH shot just 36.4 percent (8-for-22) and turned the ball over 15 times. The Blue Raiders led 14-4 through the first 11:51 of the game. However, UAH would cut the deficit to 31-24, but sophomore Caya Williams converted a pair of free throws and Edwards nailed a three to put MTSU ahead 36-24 going into halftime. In the second half, the Blue Raiders offense came out on fire. Middle Tennessee outscored UAH 20-7 to take their largest lead of the game at 54-31. MTSU would cruise the rest of the way to secure the victory in its final exhibition game. The men’s team did not have the same fortune, losing in its lone preseason game of the season 76-67. It was the first loss in a preseason game for the Blue Raiders since Nov. 5, 2002, when Middle Tennessee lost 80-73 to Global Sports Academy. At the half, the Blue Raiders held a slim 31-29 lead. MTSU could not overcome poor shooting in the second half though, and Martin Methodist would take the lead for good following a 10-0 run with just over six minutes remaining. Reggie Upshaw Jr. proved to have a nice game for the Blue Raiders, recording a double-double with 11 points and 10 rebounds. Marcus Tarrance also scored 11 points on 3-of-5 shooting from three-point range. Newcomers DJ Jones and Darnell Harris both had good games off the bench for the Blue Raiders. Jones scored nine points, and Harris scored seven points and pulled down 10 rebounds. The second half belonged to the Redhawks as they outscored MTSU 47-36 in the final 20 minutes of the game. 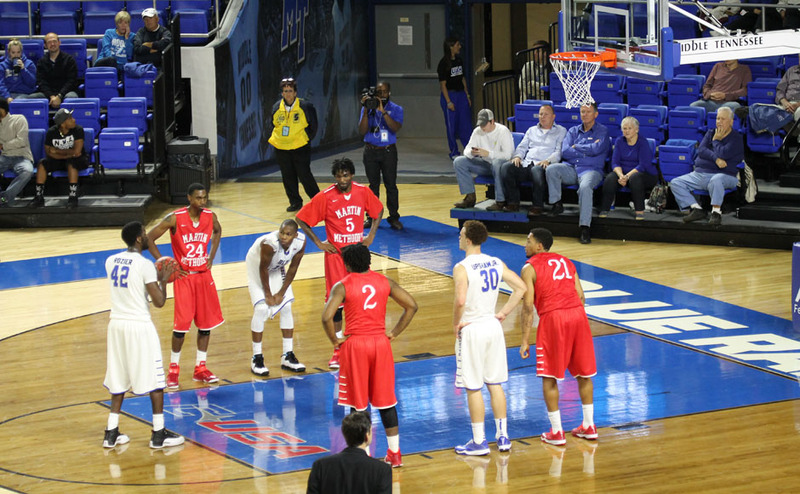 Martin Methodist shot 48.3 from the floor compared to the Blue Raiders’ mark of 33.3 percent from the field. Middle Tennessee also turned the ball over 17 times. MTSU started out strong with a 13-2 run to open the game. The Blue Raiders held Martin Methodist scoreless for nearly five minutes and led 18-8. The Redhawks would counter with a 13-2 run of their own. The run gave Martin its first lead of the night at 21-20. MTSU would quickly regain the lead on a JaQawn Raymond layup at the 5:00 mark, taking a 31-29 lead into the halftime break. Both teams would come out in the second half trading baskets, exchanging the lead five times in seven minutes. With just over 10:00 left on the clock, JaQawn Raymond would give the Blue Raiders a 51-49 lead. With 4:32 left in the contest, MTSU would cut the Redhawks’ lead to six. The Blue Raiders would not come any closer though as the Redhawks would finish off the nine-point victory. Martin Methodist’s Monte Burney led the way with 16 points, as four Redhawks scored in double-digits. The Blue Raiders women’s team will open regular-season play at Arizona State Friday at 6 p.m. The men will start regular-season play against Ohio Valley Nov. 14 at the Murphy Center. Tipoff is set for 7 p.m.